In order to connect a Facebook Group to your Social Web Suite account, we’ll need to authenticate through your personal Facebook Profile that has “Admin” role on the Group you’re looking to connect. It is not possible to connect Groups that you are only a member of. More information on Facebook Page Roles can be found here. Whilst we authenticate your Facebook Groups through your personal Profile, we won’t access your personal information or publish content on your Profile. 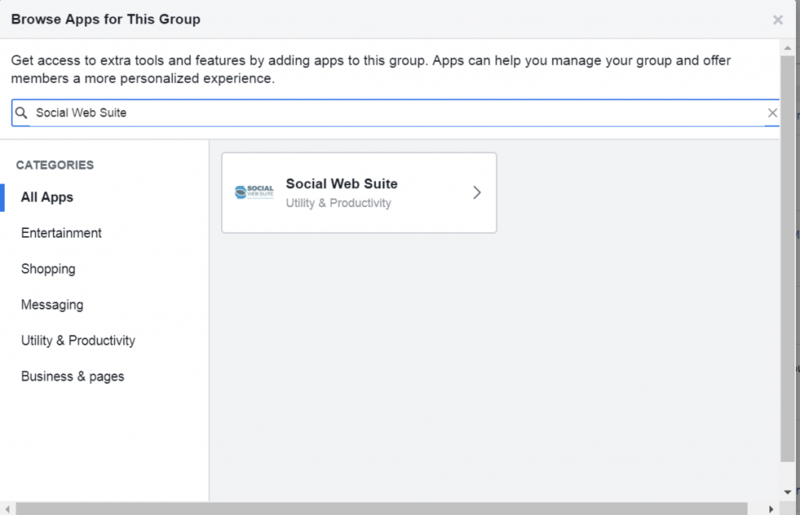 Connecting Facebook Groups requires an additional step of adding the Social Web Suite app within your Group settings in Facebook itself. Click on the Group you’d like to connect and add it to your Social Web Suite account. Now go to that Facebook Group, click More and then Edit Group Settings. Go to the Apps and click on Add Apps. then click on the app and Add it. Click the save button at the bottom of the page and go to your Social Web Suite account and post something to that group. You may need to repeat the above steps for each Group you have connected.